I have several sets of utensils and find a use for each and everyone. One of my favorite kinds of utensils are silicone and bamboo, or wooden. 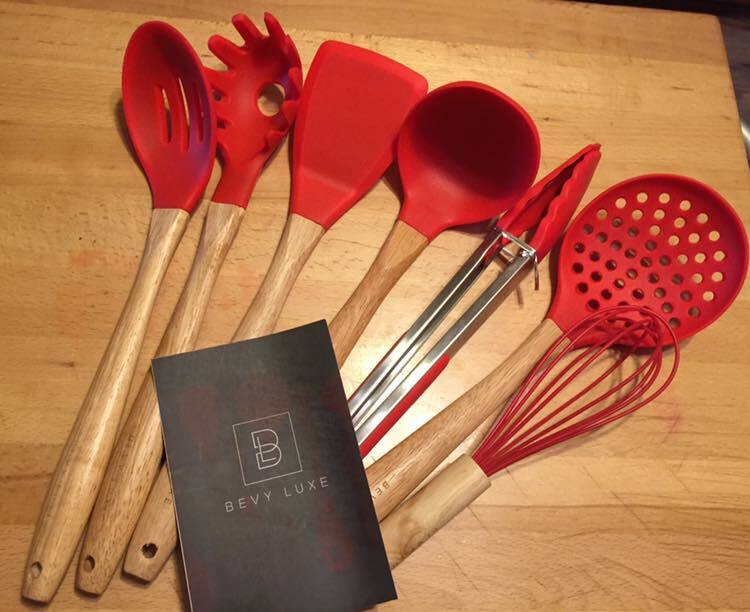 This put two of those together in my favorite color red so this goes great with my kitchen items. I love how easily the utensils wash up after use. They are Stain Resistant. I do my dishes by hand but if I ever get a dishwasher I know it will be safe to use since they are also Dishwasher Safe. Cooking and Baking are one of my favorite things to do with my children which is why I suppose they can all cook and bake well. None of my kids are starving as long as they can find food to make a meal with. I hope see these utensils in more color varations in the near future but until then my readers can enter to win a 500.00 Amazon Gift Card to get their shopping started, or order their own set below. The Giveaway ends soon so make sure you enter while you can. Some of my readers will be able to get a 20% on the set here.